From the ten-time New York Times bestselling author of Ultrametabolism, The Blood Sugar Solution, and Eat Fat, Get Thin comes The UltraMetabolism Cookbook. 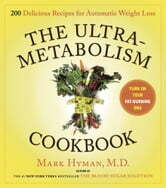 The perfect companion to Dr. Hyman’s New York Times bestseller, Ultrametabolism, The UltraMetabolism Cookbook has 200 convenient, easy-to-prepare, and, delicious recipes geared to each phase of the Ultrametabolism plan and designed to kick your metabolism into overdrive, change the way you eat, and establish a lifestyle shift to help you feel better and keep the weight off. The first part of the book takes the reader through the three-week detoxification of Phase I and offers a wide variety of delicious and easily prepared dishes like Roasted Shrimp, Turkey and Red Bean Chili, and Ratatouille. Phase II rebalances your metabolism in four weeks and offers the way to a healthy metabolism for life with recipes for satisfying, flavor-packed appetizers like Curried Deviled Eggs with Cashews, as well as many more new salads, meats, fish, shellfish, soups, poultry, grains, vegetables, breakfast foods, snacks and, of course, lots of plant-based options and bean dishes for vegetarians. Based off cutting-edge nutritional science, these great recipes will help you integrate the UltraMetabolism way of eating into your lifestyle, from quick weeknight suppers to entertaining and holiday meals.